With a few bank holidays around the corner, it’s the perfect time to give your caravan, campervan or motorhome a good clean. 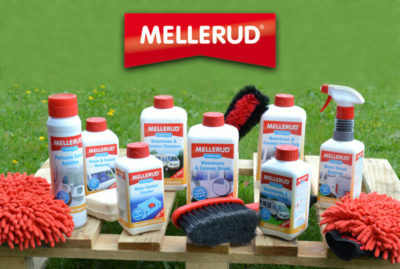 Last month we had a stash of specialist cleaning products and kit to giveaway from Mellerud. 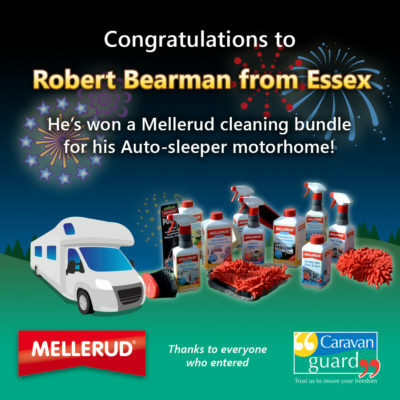 After more than 1,200 entries, this fantastic cleaning bundle is on its way to Robert Bearman from Essex. He has no excuse for making sure his Auto Sleeper Sandhurst motorhome isn’t sparkling and clean for the 2019 holiday season! Thanks to everyone who entered and don’t forget to watch our videos for our guide on how to clean your caravan or motorhome as well as our hints and tips on cleaning your caravan roof and your motorhome roof. They’re all on our YouTube channel as well as in the videos section on our news blog. For more information about Mellerud’s products visit their website. Their cleaning range is available to buy online from manomano.co.uk, plus some independent retailers stock their range.